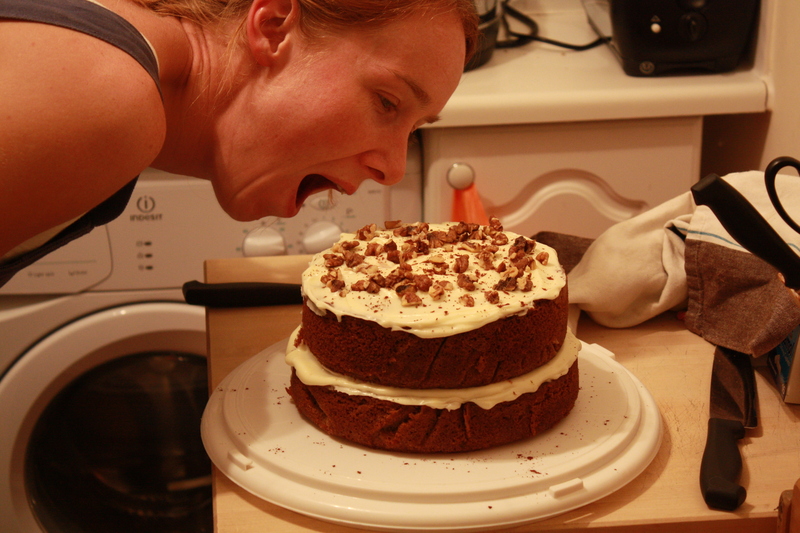 The Infamous Hummingbird | It's all about the cake! This cake apparently originated from the southern American states. It is said to have been around for quite a while. I am therefore always surprised that no-one I bake this for has heard of it or eaten it. Anyway, once they do, they are always wanting more and wondering why they have only just discovered it! There are no hummingbirds in this cake. It has been said that it is named so because the cake is sugary rich and is therefore like the nectar that hummingbirds like to feed on. Whatever the name, the cake is a moist and packed with flavour. Similar to a carrot cake in many ways, but with banana and pineapple. A great all-rounder to spoil your guests with. Preheat the overn to 170C, gas mark 3. Grease and line two or three cake 20cm cake tins, depending on how many layers you want. Put the sugar, eggs, oil, banana and cinnamon in a bowl and mix together until well incorporated. Slowly add the flour, bicarbonate of soda, salt and vanilla essence and continue to beat until everything is well mixed. Stir in the chopped pineapple and pecan nuts carefully until evenly dispersed. Pur the mixture into the prepared cake tins, dividing evenly and smoothing over. Bake in the preheated oven for 20-25 minutes or until golden brown and the sponge bounces back when touched. If you only put into two cake tins, it will need a bit longer than this. Leave the cakes to cool slightly in the tins before turning out onto a wire cooling rack to cool completely. As you can see, I went for the 'two cake tin' option, one of which is smaller than the other. It didn't seem to affect the taste though! Now make the cream cheese frosting. Beat the icing sugar and butter togetyher until they are well combined. Add the cream cheese in one go and beat until it is completely incorporated. Continue beating until the frosting is light and fluffy (approx. 5 minutes – it helps if you have an electric mixer at this point!). Do not overbeat, however, as it can quickly become runny. When the cakes are cold, spread a layer of the cream cheese frosting onto the first one. Place a second cake on yop and cover with frosting too. Also cover the side with frosting if you want. Finish with pecan nuts and a sprinkling of cinnamon.